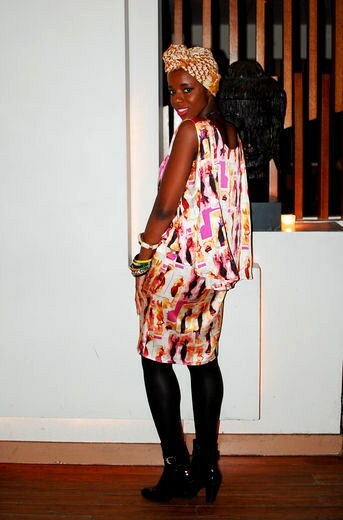 ← My 5X5 Stylecaster Feature! 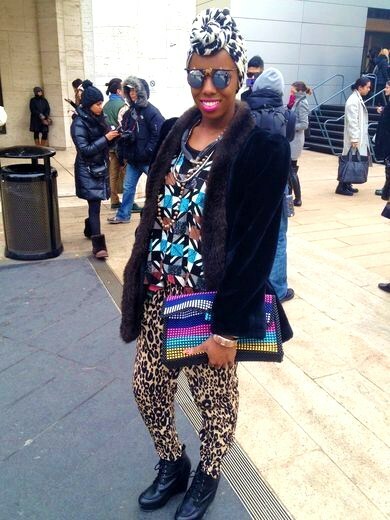 My Daily Looks for NYFW Fall 2012! This NYFW season was indeed my favorite! I was very busy as I was editing my essence.com Daily Style Chronciles post, writing show reviews for Huffington Post-Black Voices and interviewing international designers for Heritage1960.com. 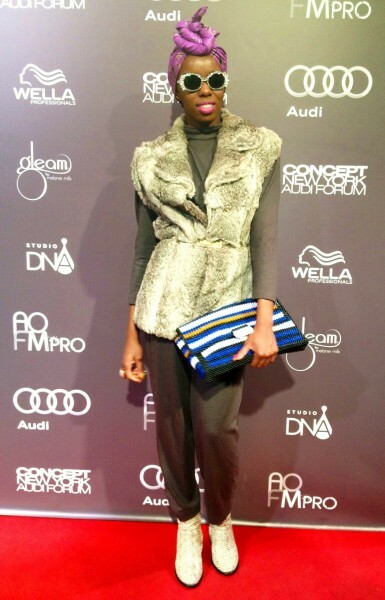 It was a season full of my fiercest looks, with pieces from Jewel by Lisa, Avnah and Mercura Sunglasses. Here are each of my NYFW looks! To read more about looks 1-6, click on the day! Jewel by Lisa dress. Aquatalia boots. Vintage 1970s head-wrap. Nigerian bangles. Feather piece by Avnah. Anne Taylor turtleneck. Forever 21 skirt. Aquatalia boots. African headwrap. Jewel by Lisa clutch. Mercura heart-shaped glasses. Vintage Jordache coat. Jewel by Lisa top and clutch. H&M pants & scarf. Urban Outfitters boots. Mercura sunglasses. African necklaces. Ellen Tracy coat. Jewel by Lisa top. 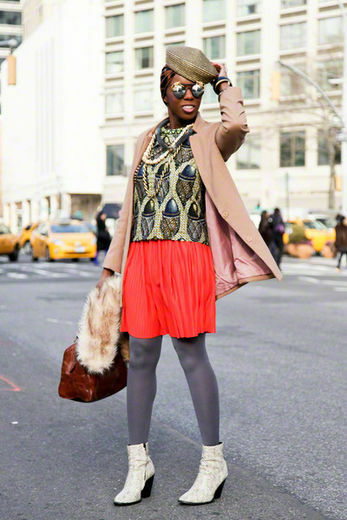 H&M skirt, jean jacket, tights and animal print headscarf. Urban Outfitters shoes. Vintage hat, Jeremy Scott bag. Keith Haring necklace. Nigerian bracelets. 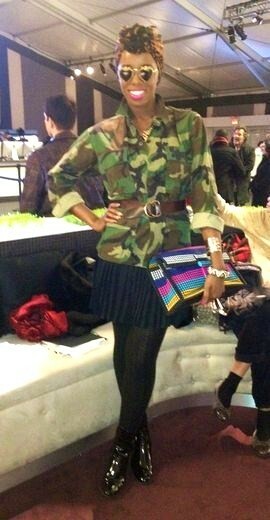 Vintage army jacket, skirt & belt. H&M scarf (as headwrap). Mercura sunglasses. Jewel by Lisa clutch. Aquatalia boots. H&M gold bangle. Forever 21 tribal bangle. Keith Harring necklace. Vintage coat and jacket. Urban Outfitters dress. Forever 21 scarf (as turban). Jewel by Lisa clutch. Aquatalia boots. Mercura “Monkey” sunglasses.H&M cuff. Ankara headwrap. Vintage fur vest & jumpsuit. Matisse boots. Jewel by Lisa clutch & belt. H&M cocktail ring. Mercura sunglasses. So many fierce looks! Which one is your fav? 2 Responses to My Daily Looks for NYFW Fall 2012! 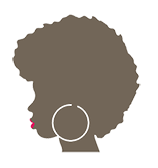 I just discovered your blog through Essence and realized I pinned your Day 2 look on Pinterest last week. I admire your eclectic style. Kudos! Love these looks each one is its own creation!! !